The KCHBR was conceived by Andrew Skurka. 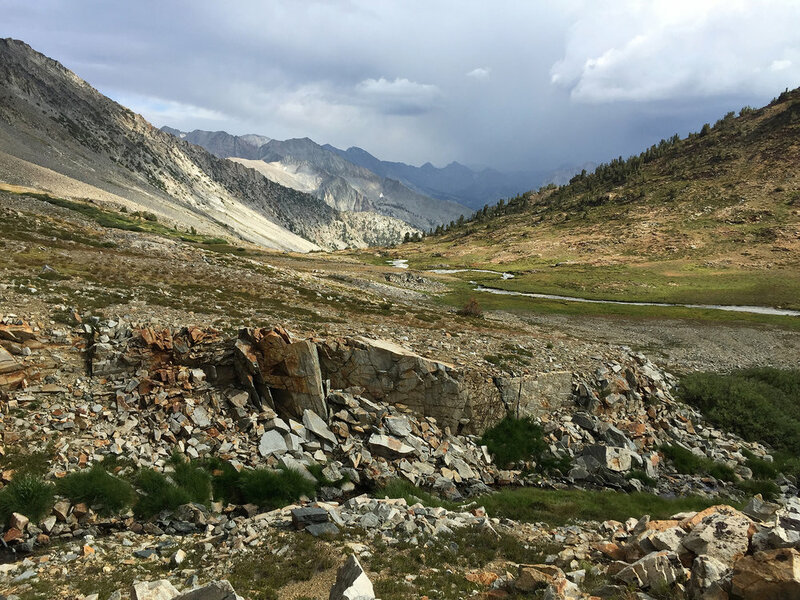 Here is an edited excerpt from his description: “The Kings Canyon High Basin Route (KCHBR) runs 124 miles within the Kings Canyon National Park. 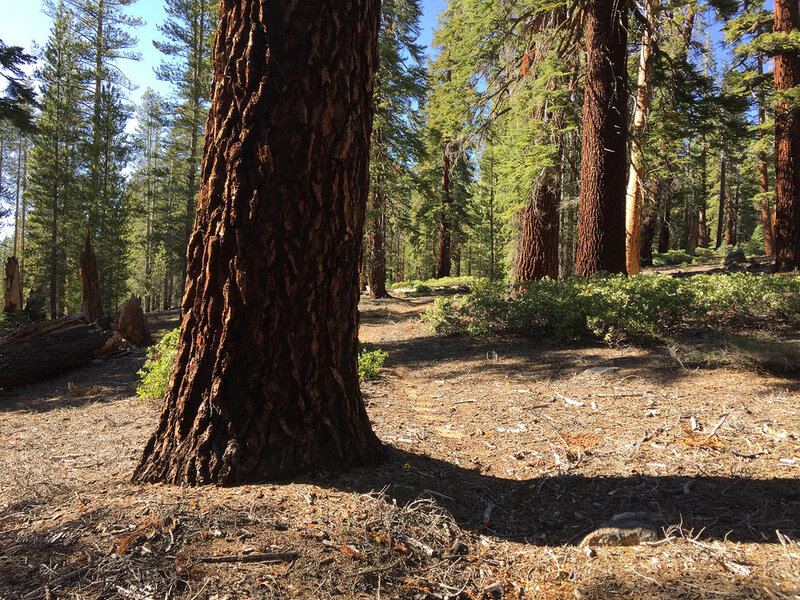 Two-thirds of its distance consists of either off-trail travel or along barely extent abandoned trails that were once used by miners, herders, and early High Sierra explorers. It is not officially recognized by the National Park Service and it has no dedicated on-the-ground signage or blazing. 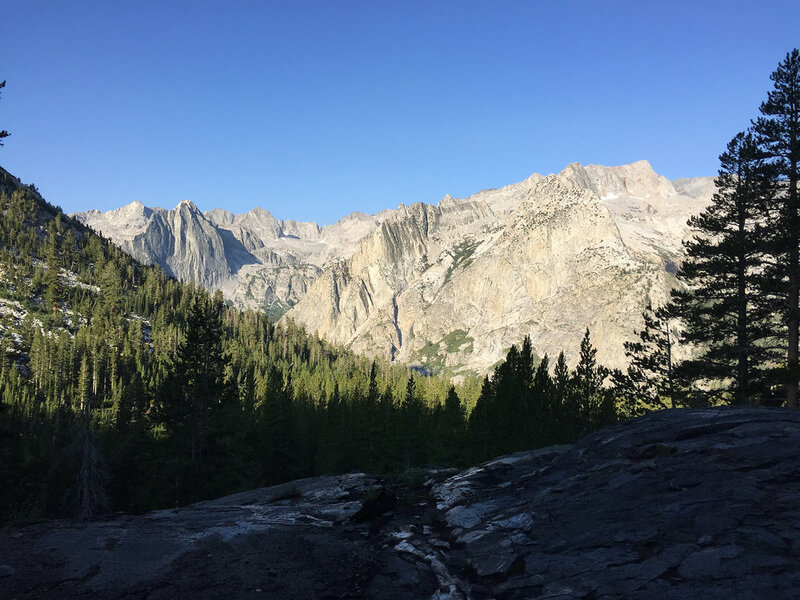 It averages 725 vertical feet of change (up and/or down) per mile, compared to 375 for the John Muir Trail and 310 for the Pacific Crest. 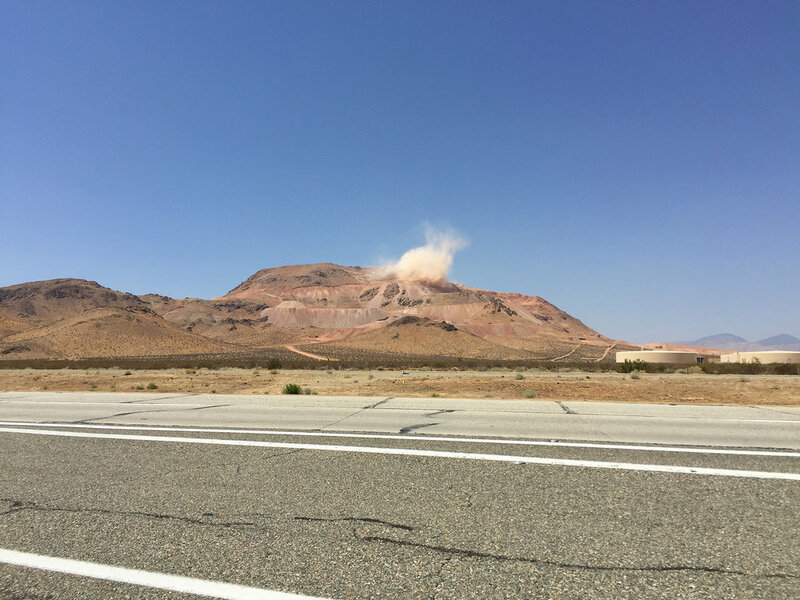 It typically hovers between 9,000 and 12,000 feet above sea level, where there is 65-73 percent as much oxygen as there is at sea level. Starting food weights are considerable because resupply points are inconveniently far off-route. There are multiple Class 2 passes and many sections of extensive talus, ranging in size from basketballs to refrigerators. 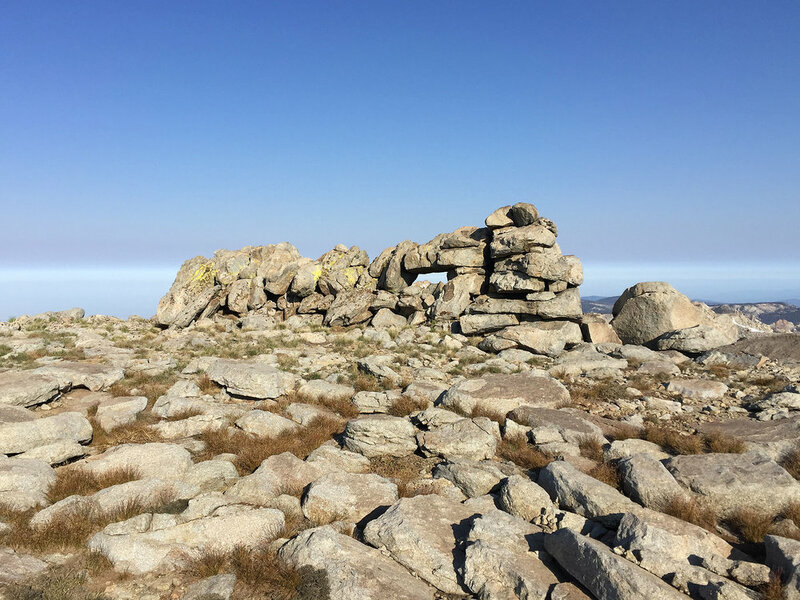 In the summer of 2018 I walk my own version of the route broken up into three sections, in June, July and August. 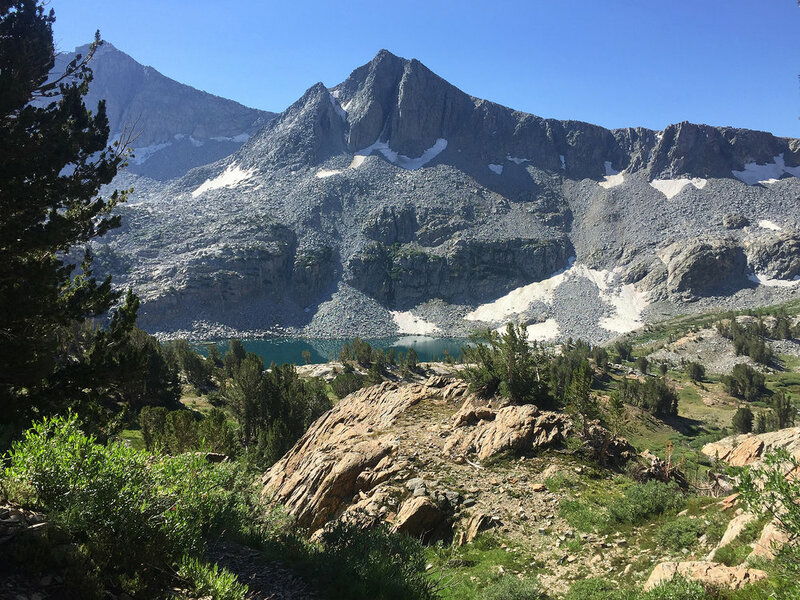 For my version I add extra mileage to include another, more northern destination, and I do not walk the last portion of Skurka’s route as it somewhat duplicates what I walked the previous summer when I completed the Sierra High Route (SHR). My final walk takes a total of 22 days, where I travel 186 miles and climb 58',000’. 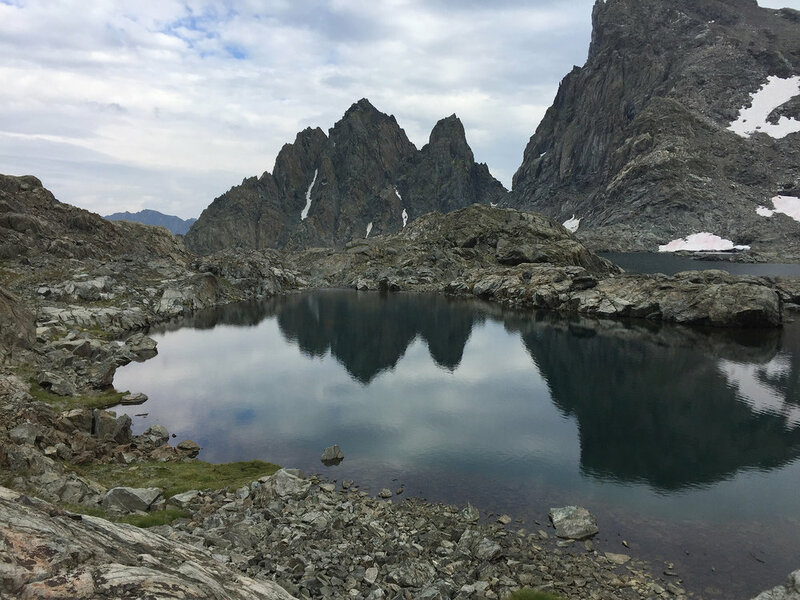 I trained reasonably hard for several months in advance, including climbing over 22,000’ of local peaks, running up 1,600 steps every day, and completing a fast 67 mile hike in March. Nevertheless, I still got “worked” pretty hard, and enjoyed (almost) every moment of it. Section 1, June 5- June 12, 55 miles, 21,096’ ascent. For the first section I choose a loop to depart from Lodgepole and end up at the Cedar Grove/Road’s End trailhead. This means I have to first drive to Lodgepole to get my permit, then drive to and leave my car at the Road’s End trailhead, and then hitchhike back to Lodgepole to start my trek. It is 7:00 am, and there is not a lot of action on the trail quota sign. The early season and snow keeps them away. Next, the drive to Cedar Grove/Road’s End trailhead. The hitchhiking takes several hours but goes incredibly well and is fun, reminding of my teen years when I hitchhiked a lot. I get four rides in quick succession. I first ride in the back of a truck from the Road’s End trailhead to the Cedar Grove campground. After my truck ride, I then ride with a young man and his dog; the small truck is jammed with equipment and so the (stinky) dog rides on my lap. I go a shorter distance to a road turnoff with a couple from San Diego in a Mercedes Sprinter. Finally I ride with Stefan and Emila from Essen Germany, pictured above. When the park erected this sign many years ago they may have known that it would become a Kodak Hotspot, but probably never dreamed that this function would morph into prime Instagram Bait. At Lodgepole I hang with the tourists for a bit and do some pre-trail hydration with liquids that I normally would never consume at home. Food expectations change at trailheads. 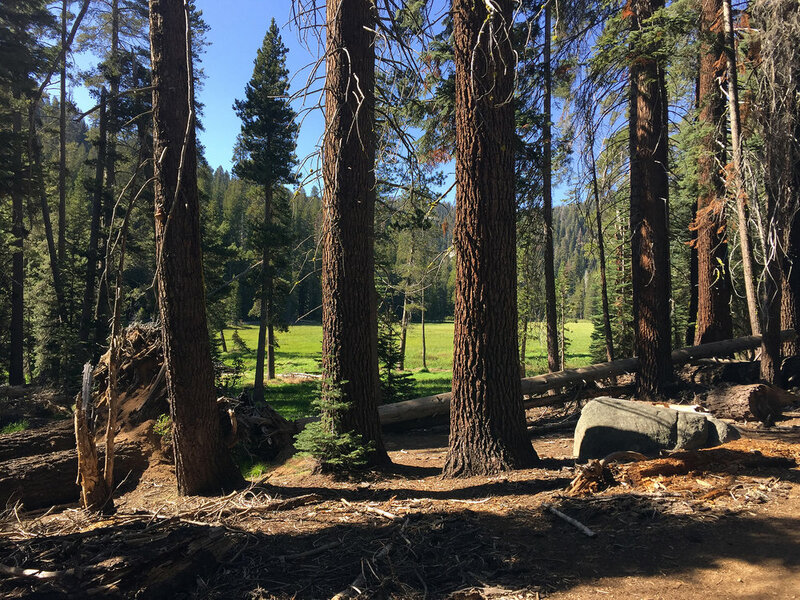 My brief time on trail is pleasant, featuring an exceptional meadow. I leave the trail to follow to clear use-trails probably reinforced by peakbaggers headed for Mt. Silliman. 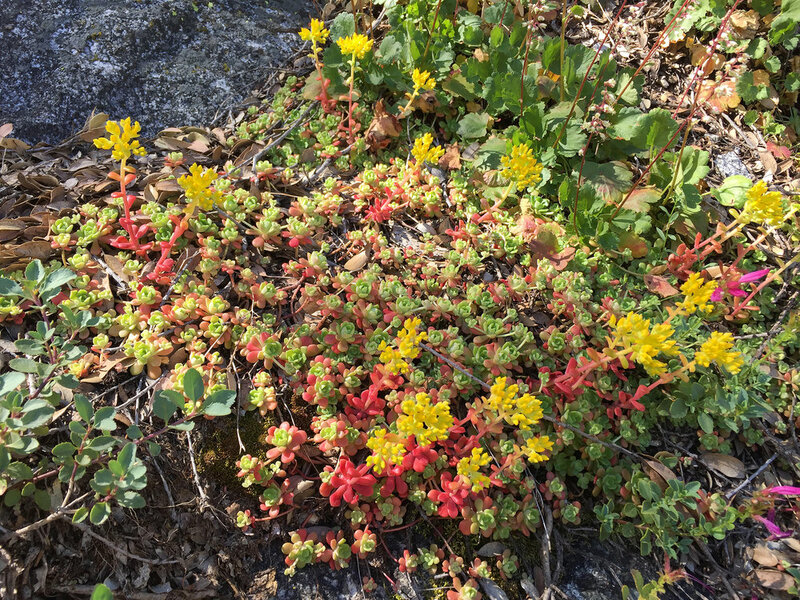 Early season trips are rewarded by early season flowers. I reach snow at 8,000’ and keep going. 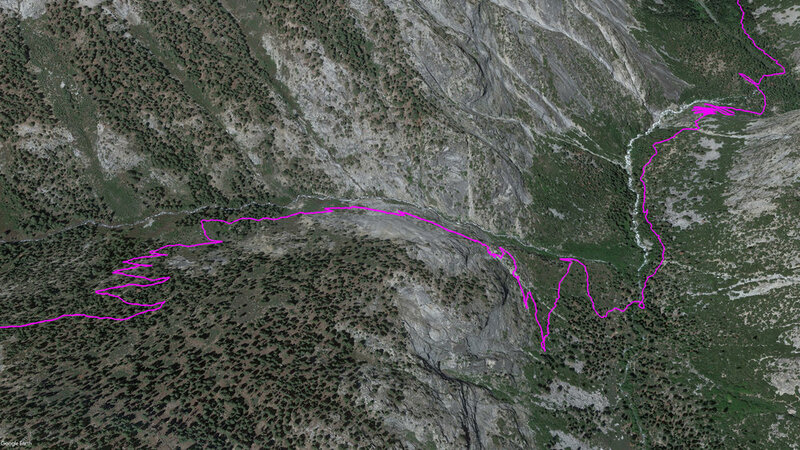 This Google Earth image shows the trek up from the trailhead to Mount Silliman, and then onwards. At morning’s break I climb to the top of Mt. Silliman. The peak register is a funky Star Wars lunchbox. At the top, I see my upcoming adventure stretch in front of me. I will probably need the crampons to make up to the pass. The Tablelands stretch in front of me. I make a detour for peak 11462, where I find this strange rock composition.. Some shadowplay from 11462, looking back to Silliman. I pass by Big Bird Peak and I now regret not climbing it; it would have eaten at least another 3 hours out of my day but I should have done it. At my camp that night there are a few marmots near me. They are mostly interested in digging up some nearby root, but the older one clearly also thinks my pack is interesting, so I have to shoo them away as I do not want them to chew holes in my pack. The snow cornice at Lonely Lake Pass (Horn Col) is higher and steeper than what the photo suggests, so out comes the ice axe. I make a long crampon traverse in the bowl below Elizabeth Pass. It is early morning and the sun does not hit the snow at a direct angle, but I begin to be concerned about snow stability and post-holing (falling deep the snow). No other people tracks are apparent. 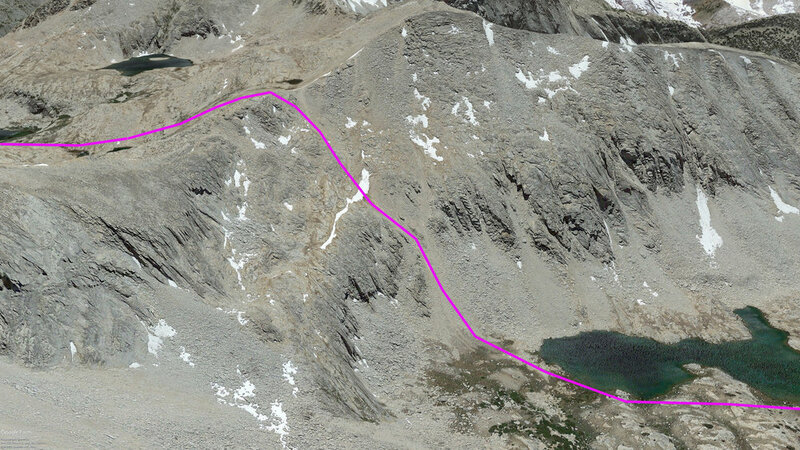 I make it across the bowl and up to Copper Mine Pass, all the time with some concern about avalanches. I know perfectly well that the snow has probably settled enough to be safe this late in the season, but every time I see a crack or slump I become uneasy. I keep going to the top of Copper Mine Peak. The composition of the rock at the top is unusual and I guess hinted at the possibility of mineral extraction, hence the name “Copper Mine”. The memorial on the register is both sad and touching. As if the top of a steep pass is not interesting enough, the occasional snow cornice throws in some spice to the descent. I make it down the snow cornice no problem, but start post-holing. It is later in the morning and the snow is oriented towards the morning sun more directly. 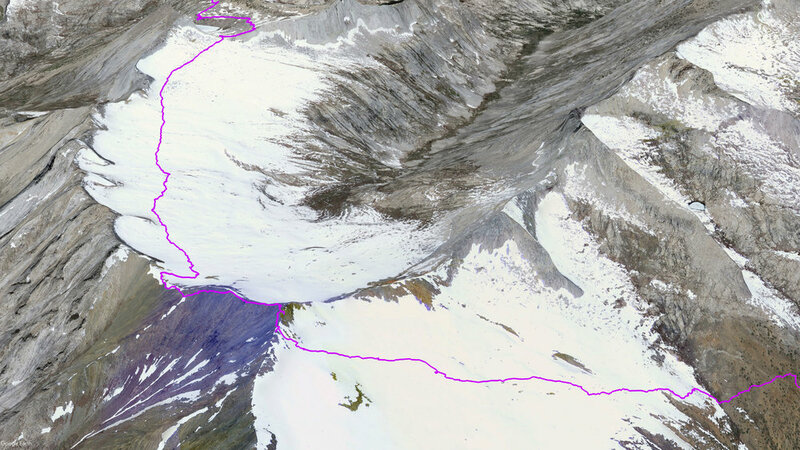 This Google Earth view shows the trek across the Elizabeth Pass basin, then Copper mine Peak, and the very long descent towards Cloud Canyon. I fall through the snow many times, sometimes as deep as my waist, usually with only one foot. It is extremely hard to extract your leg from a snugly fitting hole while wearing a backpack and trying to not have the other leg drop in as well. I fall through at least ten times. It is not only exhausting but hazardous. Last summer around this time the snow was firm enough for just crampons, but this year it would have been better to have some snow shoes in a few places. I later learn about two other people whose summer plans were changed as a result of early-season post-holing injuries. The view back. I finally reach solid ground, and I am knackered. My first quick dip of the season. I am restored by the water and the sun. As I descend Cloud Canyon, I keep getting caught up in the worst combination of large rocks and thick brush. It is like quicksand and somewhat frustrating. I am glad to have my nano net under the tarp as the mosquitos are swarming. I find some trail steps that are artfully well executed and are certainly very old. Colby Lake, 10,584’, is thawed and beckoning. I am surprised that there is no ice given all the snow I just crawled through. After I pass Talus Lake, I come across a typical situation; the fairly safe option go around this outcrop by descending a few hundred feet to go around its base, or go to the right and up and over, with a very uncertain and possibly too-steep surprise drop on the other side. I opt for the safe route and do not enjoy it at all, very talus-y, and I hurt my foot as well. Viewed from the other side, I probably made the right decision. I could have come down the obvious gash, but when you are standing above looking down it is oftentimes not obvious what is the best path down. 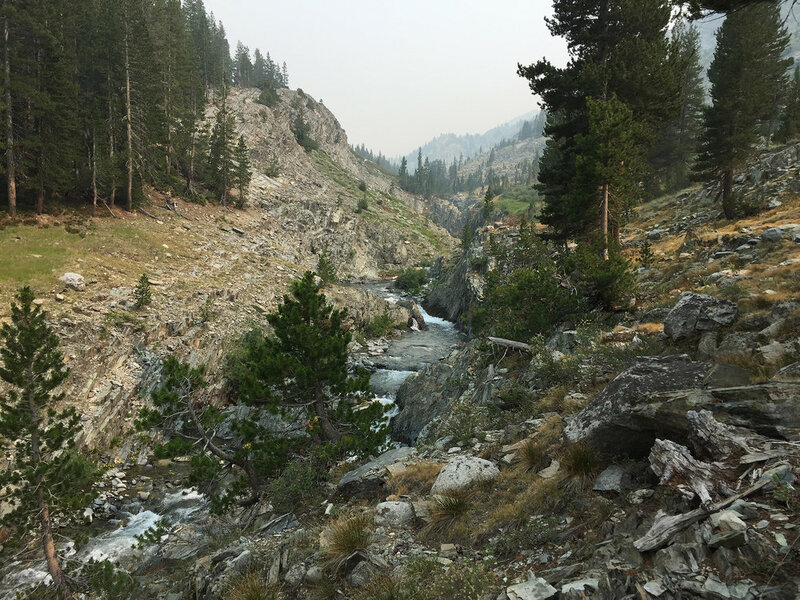 I approach the pass under Thunder Mountain, and it is rough going again; I am post-holing, concerned about getting water, and not sure that I have enough daylight or physical strength to make it over the pass. I find a trickle of water and begin to look for a spot to bivuoac on the side of the hill just below the pass. 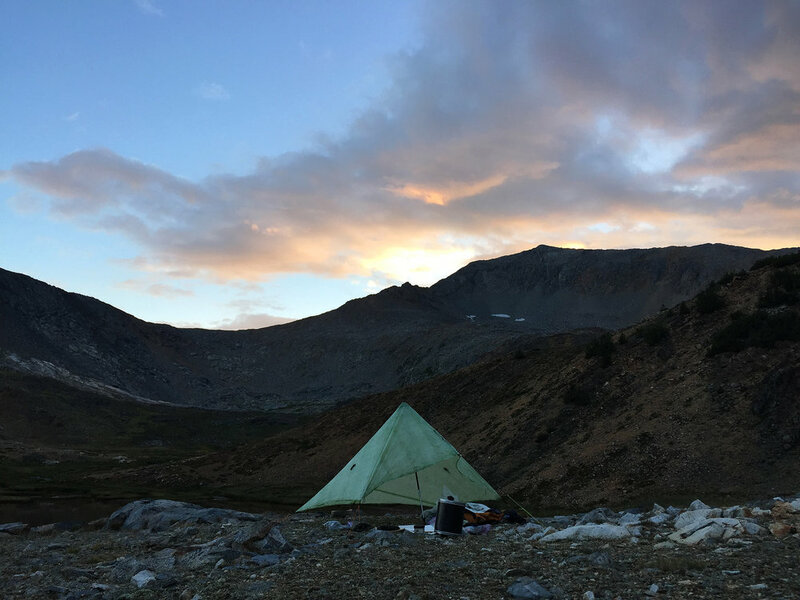 The wind is not too bad and I pass a good albeit freezing night on my extremely small perch below the pass at about 12,000’. The walk up Cunningham Creek is pleasant and easy navigation. I reach the top of Longley Pass to find a massive overhanging snow cornice. No way I am dropping over it, and there is no acceptable way to climb around it on the right. The way around it on the left is far more steep, high and treacherous than it appears in the photo. Yes, if I had a super-compelling reason and absolutely had to take this route, I could do it, but I prefer to live to tell about it, and decide to change my route by backtracking down the hill. This Google Earth picture tells the story pretty well, except that there was a lot more snow than what is shown in this satellite image. The next day, as I make my way down Cunningham Creek, I get a good distant view of the Whaleback. I must drop 4,000’, through some really unpleasant brush. My path around the Whaleback on the ascent and up to Colby Lake. Progress is slow and unpleasant through this brush. Great relief to reach the bottom to Cloud Canyon and a picturesque trail, despite the heavy mosquitos. After several days of slogging off-trail, I am amazed how fast and easy trails are. I climb a few thousand feet up to Avalanche Pass. The next morning is a fun and fast precipitous descent down Sphinx Creek and to my car waiting for me at Road’s End. Near Road’s End I see evidence of the controlled burning in the area that seems like it has been going on for years. 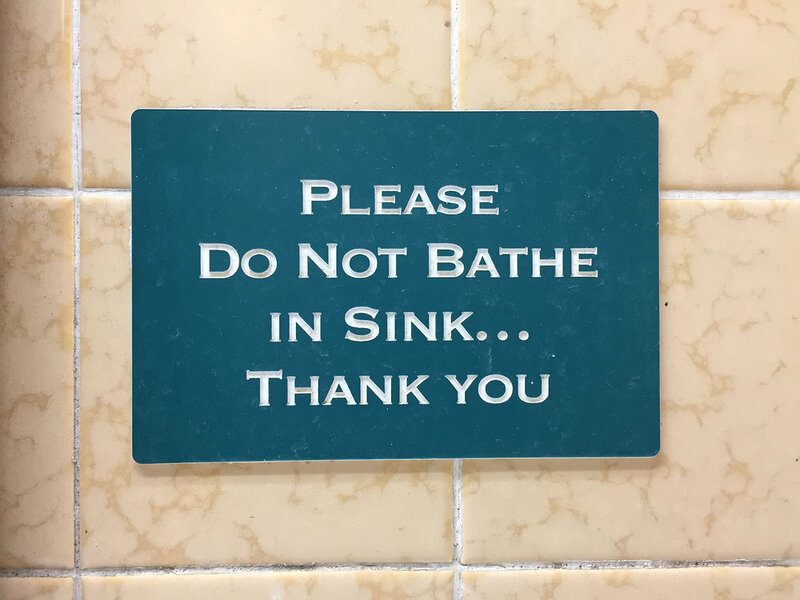 Well, if you come off a week-long trip really looking forward to a shower, and they close the showers from 1-3 in the afternoon, a bath in the sink begins to sound desirable. Section 2, July 24- August 1, 90 miles, 22,251’ ascent. For my second trip I combine a meet-up with some folks from the Highsierratopix website with the other objective of accomplishing the most northern part of Skurka’s KCHBR route by passing through the Ionian Basin. I drive up from Los Angeles that morning and visit the Lone Pine ranger station to get my permit. The view is encouraging, most of the snow is gone, and there is no smoke haze from the perpetual fires. I prefer to leave my car in Bishop, the town below the pass where I intend to exit at the end of my trip, and put out my thumb. I hope that my clean appearance and the climbing helmet will help me to snag a ride. After one hour in the 103 degree heat, I give up and drive all the way up to the McGee Creek trailhead, which is a fast way to get started but means that I will have to go retrieve my car after I finish my hike. 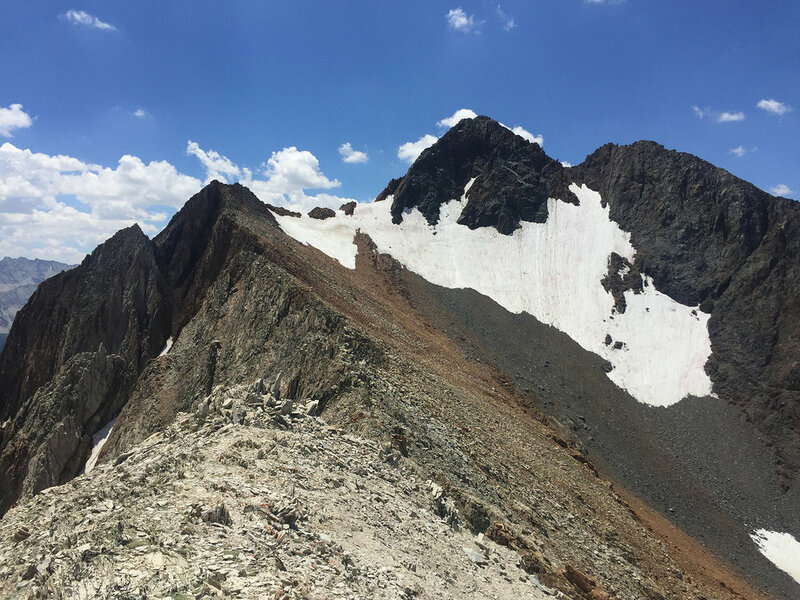 This view shows the second day with an attempted ascent up Red and White Mountain, McGee Pass, the attempted ascent up Red Slate Mountain, and the third day with Pace Col, and Grinnell lake, the site of the meet-up. The late day hike up from the McGee trailhead is inviting. I awake to a beautiful day and view. Big McGee Lake beckons and I jump in. I leave the trail to ascend Red and White Mountain. I observe the two women I met at Big McGee Lake ascending the trail to McGee Pass as part of their a day hike to Red Slate Mountain. There is some vertical climbing on the way to the Red and White summit. I get to the top of the first ridge to discover a nasty bit of steep snow along the ridge to the peak. I did not bring traction and am unprepared for this final surprise. With warm weather I could probably kick step into the snow along the ridge, but it is still too funky for me, and I elect to turn around. At the ridge I get a view of Red and White Lake and the path I will take in two days. I pay no attention to it at the moment, but that finger of snow running at 11 o’clock from the lake will prove to be a hazardous obstacle. I descend and wind my around and down and then back up to McGee Pass, where I meet the two women I spied earlier, they just having completed climbing Red Slate Mountain. The mountain is tantalizingly close to the pass, but I have a hard deadline to make a meet-up date by tomorrow afternoon and decide to move forward and will decide tomorrow if I have enough time and energy to return to attempt a climb. I make my way up to the base of Fish Creek and take an early day. I awake early the next morning and decide that I will try to climb Red Slate. I arrived here yesterday from the pass from the right, but this morning I will charge straight across and go up the low side on the left and hopefully follow the ridge to the top. It is about a 1,800’ climb. I start slogging through very loose and very vertical medium size rocks, sliding quite a bit backwards with each step, and not enjoying it very much. I decide to quit at 1,000’, enjoy the view, and turn around. This is the view of where I came from and will return to. I will go up Fish Creek valley, to the right of the first prominent peak in the foreground left. There are interesting, very defined slurry mounds at the base of the hill. The walk up Fish Creek is a fun combination of creek, green and large rocks. I arrive at Red and White Lake, and must decide which way to circumvent the lake to climb the distant pass. Most accounts advocate the left side with its attendant class 2 loose scree and a stretch of snow, but I opt to go right as I prefer simple but stable climbing to loose scree. 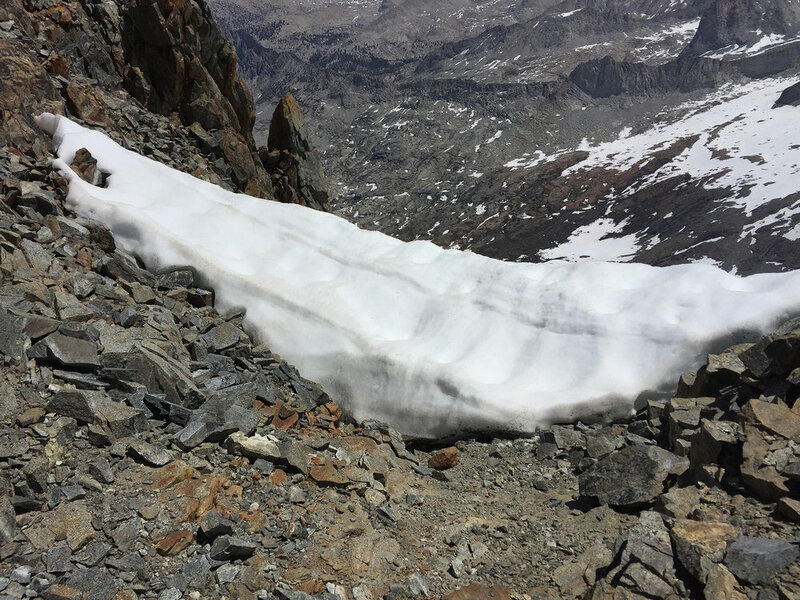 Progress is slow but generally ok until I come across this vertical slide of icy snow, which could lead to a quick and nasty plunge down into the nearly frozen lake below. I must climb about 60’ of reasonably stiff class 3 rock to go over this detour on my way to the pass. A few hour’s work and one very dramatic lightning storm later I arrive at the top of the pass with the Grinnell Lakes below. I read accounts later of some who did not make it to the meet-up because they they turned back because of the storm. I find a few of the people from the meet-up, which is a group of people who regularly exchange information on the website highsierratopix.com, many of whom are only meeting each other for the first time. I set up my tarp as I cannot predict if there will be rain. I first meet Rich who is tying up a fishing lure alongside his young dog Beau. Beau is a beautiful animal although a bit hesitant with strangers. Rich shares his fried fish with the group. The next morning Rich, Beau and I depart south offtrail to seek the Laurel Creek trail. It is fun to see Beau negotiate some difficult terrain. Yes, Rich and I did have a discussion about his ungainly heavy pack! It does not get much more beautiful than this. Beau is in the very center of the photo. I always wonder how large rocks like this find their way to large flat open places. I get on a trail and haul fast. Laurel Lake Trail to the Mono Creek Trail, then the John Muir Trail heading south. I think that this is Marie lake. One can see some haze from distant fires. 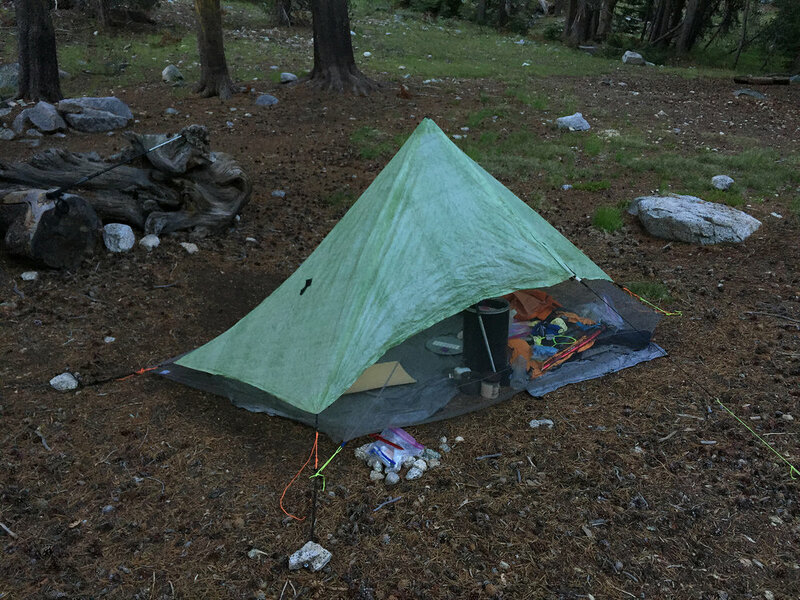 I reach Muir Trail Ranch (MTR) for a minor resupply and some USB power. 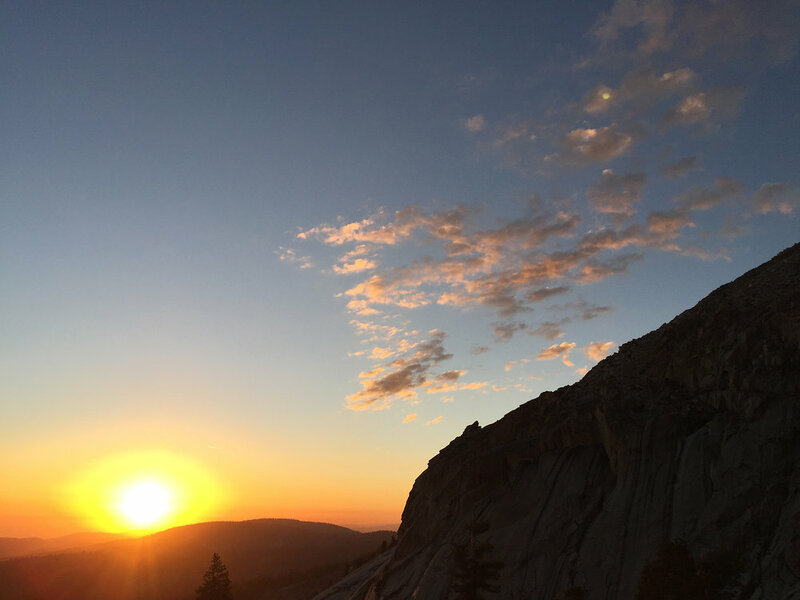 MTR is perhaps the most important re-supply mid-point for hikers on the John Muir Trail (JMT). 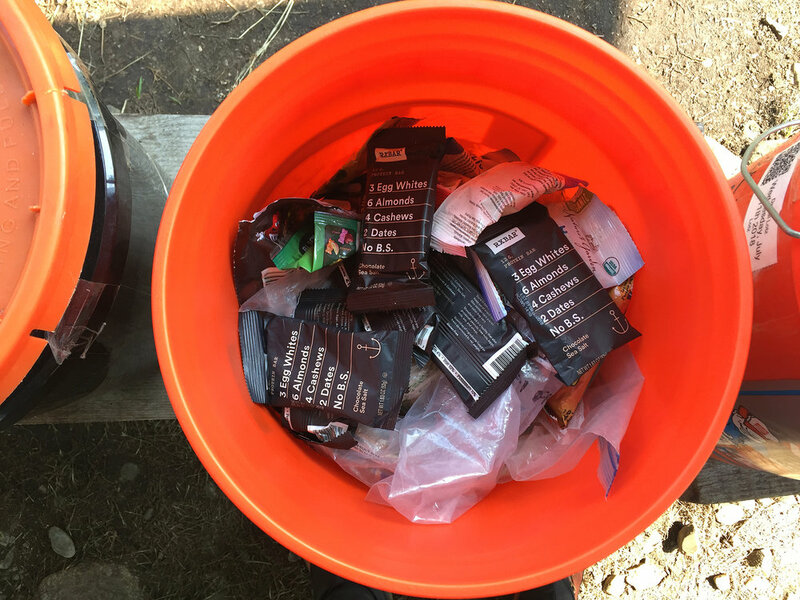 By the time hikers arrive here many realize that they are carrying altogether too much weight and they gift what they don’t want to the organized hiker bins. During high season one can find huge quantities of just about anything, and it is entirely possible to do a complete resupply by just foraging what has been left by others. Power bars, batteries, you name it. The largest quantities of left items are huge bags of oatmeal, large jars of peanut butter, and large bottles of sunscreen. It is expensive and fully-booked to stay at MTR with its tent cabins and lodge food, and I am fine crossing the wide river to camp on the other side. 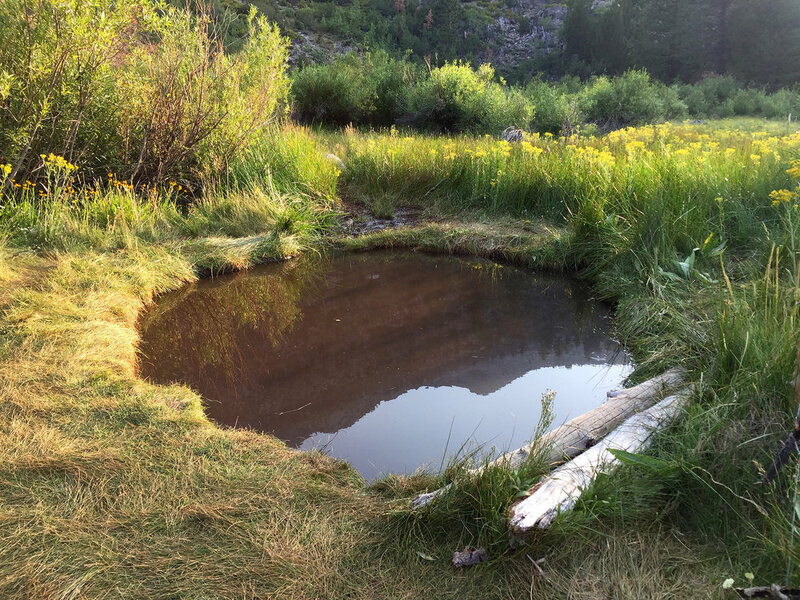 There are a few hot springs in the area which run somewhere between 90-100 degrees, and are a great way to get clean and refreshed. Some people are put off by the dark color of the water, but I find them clean and clear enough. During my 18 hours on the JMT I meet this year’s crop of hikers. Everyone is having a great time. 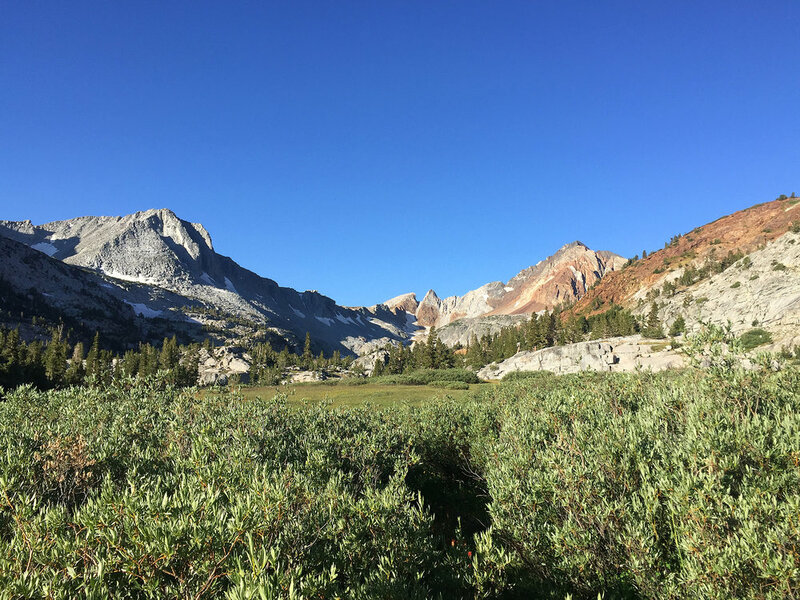 The next day I am only on the JMT for a short time, and then I turn off south to go through Franklin Meadow and up Goddard Canyon. The haze from the smoke is apparent. The use-trail peters out but navigation is easy. I spend the night at Martha Lake, and at 11,000’ the terrain has become a moonscape. 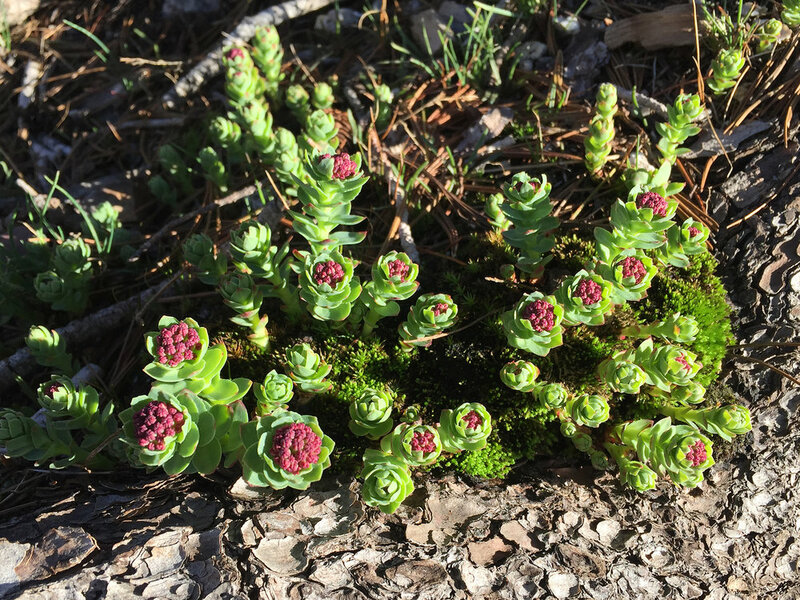 I always marvel at the plants that reappear each year in this hostile terrain. 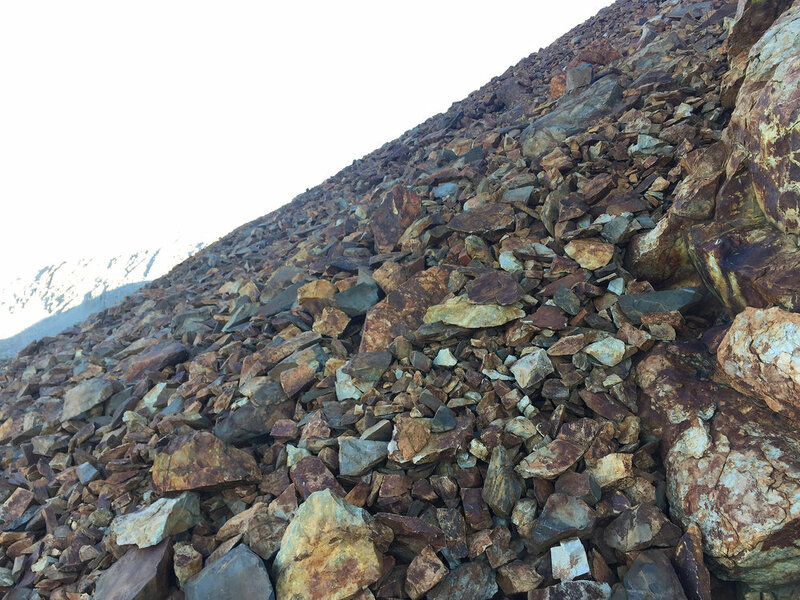 The rocks on the way up to Mount Goddard look like quarry dump, and there is a clear path no doubt etched by peakbaggers headed for the mountain. It is a reasonably firm hike up Goddard. I am at the top of the first peak, and there is a close-by second peak that apparently many do not scale. I have read several reports of climbers who balked. 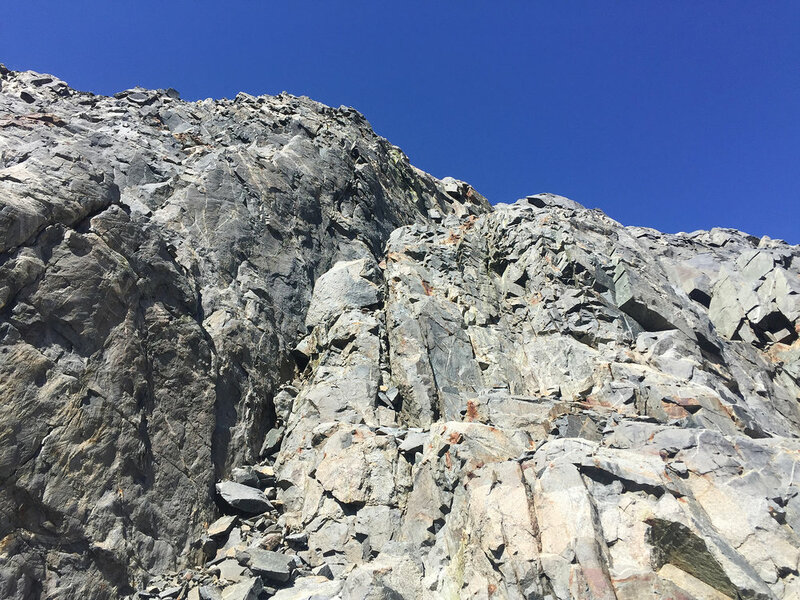 Yes, it is very high at 13,568’, and yes, it is class 3, but it is not crazy precipitous like some others and with luck a fall might only be 20’ or 30’, so I feel entirely comfortable climbing the second peak. My last major destination, the Ionian Basin, stretches out in front of me. There is something special and prehistoric about this place. Back down at the base of the hill a thunderstorm rolls in. I prop my pack up against a rock, curl up next to it with my poncho draped over everything, and fall asleep for 45 minutes while the storm rages. At the end of the storm, I am rested and dry. When the sh*t hits, there is nothing like a poncho. In the Ionian Basin I particularly enjoy all the small ponds of captured water. Navigation and travel is much more straightforward in the Ionian Basin than I anticipated from the maps. 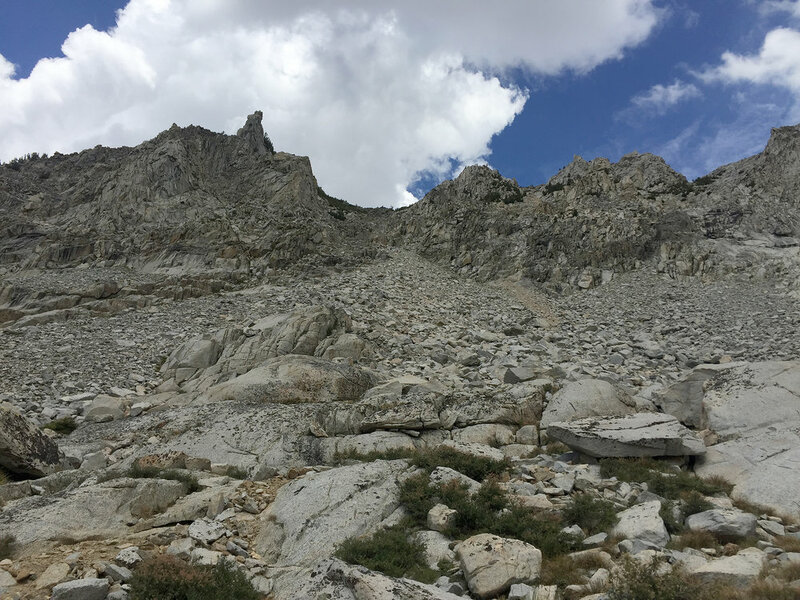 I had hoped to climb Black Giant Mountain along the way, but the clouds persuade me instead to descend as quickly as possible to the nearby JMT and keep descending to lower elevations. A brutal storm rolls in and is a bit terrifying. I really, really don’t like lightning. In the picture above you can make out the stone Muir Hut at the stop of the hill. 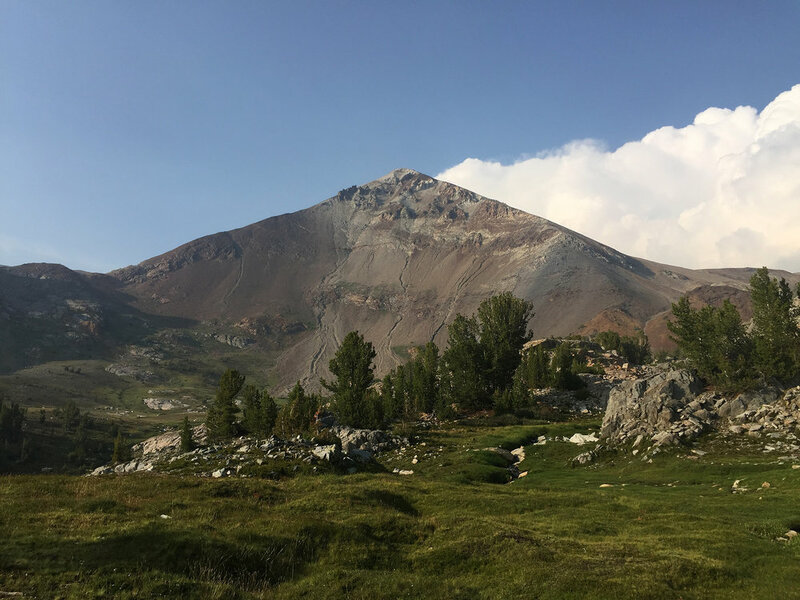 It is ironic that the hut was placed there to assist hikers in storms because the area is so exposed and remote, but taking refuge there has resulted in a few lightning deaths. The next morning I reach South Lake by 4 PM and am lucky to arrange a shuttle to retrieve my car from where I started. My new Inreach Mini tracking device has a basic messaging ability that is invaluable for making shuttle arrangements. The 76 Mule Deer who plummeted to their deaths are still there, just below Bishop Pass. 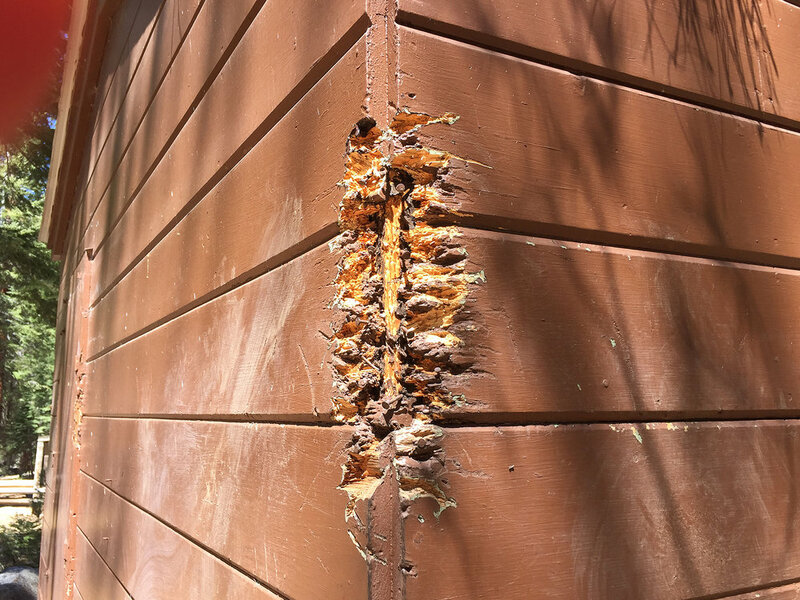 “The deer died while attempting to travel down snowfields that persisted from last winter” California Fish and Wildlife (CDFW) senior environmental scientist Tom Stephenson said. Recent freezing temperatures turned the soft snow to slick ice, according to Stephenson. “Deer were unable to maintain their footing and slid rapidly down the steep snowfields and slammed into boulder fields below.” Stephenson, who investigated mortalities at Bishop Pass, said most deer appeared to die either immediately or after traveling a short distance from the base of the snow. Link to more detail “here”. 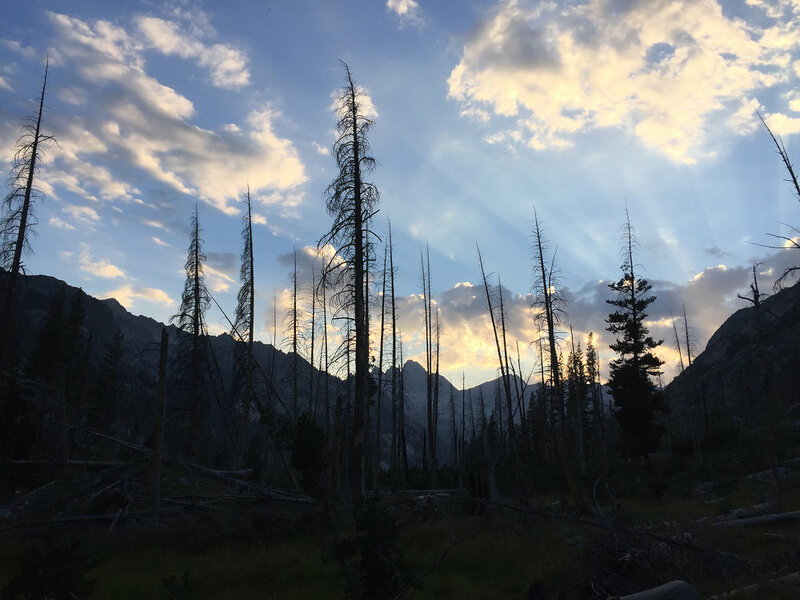 Section 3, August 14-August 19, 51 miles, 21,096’ ascent. 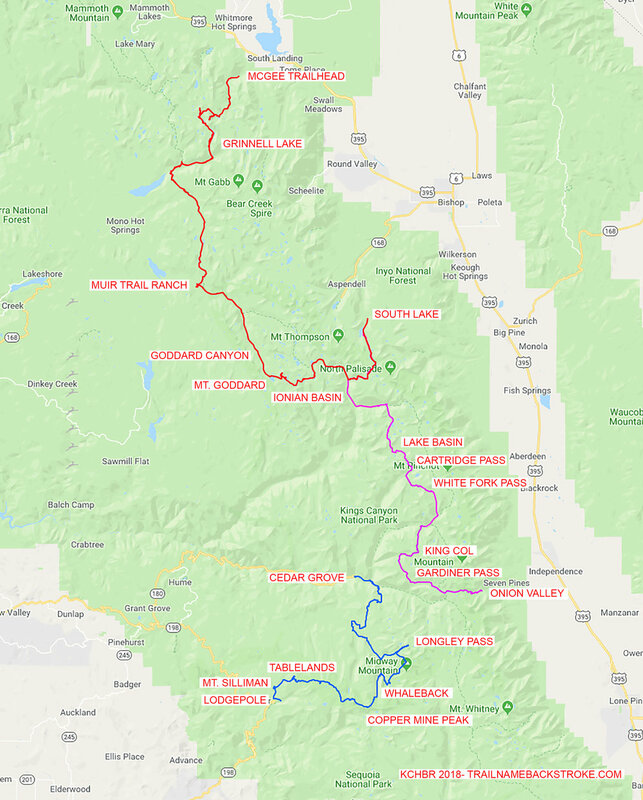 I drive up to Lone Pine in the morning, get my permit at the ranger station, leave my car at South Lake, shuttle back to my departure trailhead at Onion Valley, and walk in a few miles to Flower Lake to get a start on the trip. 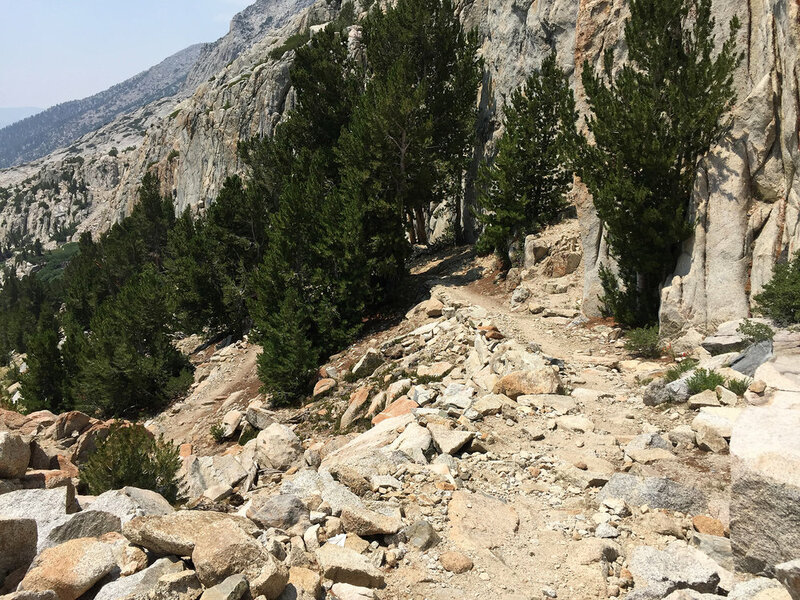 This final section is the most similar to the Sierra High Route trip I took last year in that it runs primarily north-south, with many ups and downs and high passes along the way. 7:45 am at Kearsarge Pass. The trail crossing just east of Charlotte Lake. I pass Charlotte Lake on my way to Gardiner Pass. I once saw a massive golden bear walking along this lake. As I make my way up it is interesting to compare GPX tracks, forest trails marked on the map, use trails, and the occasional marker like stacked rocks, sometimes called “ducks”. When you spend a lot of time off-trail you gain a sense of the land, and why other people or animals choose the paths they take. I make it up to Gardiner Pass, and it is no walk in the park to get there. I have a violent trip/fall. It is one of those times when after you fall, you wait a few seconds before moving as you are expecting some body part to not function. My leg gets caught in a rock, and this event both causes my fall and saves me from falling faster head-first, but it results in a laceration that still shows today as a prominent scar. I also snap my pole and sunglasses on this fall. Nevertheless I am surprised to walk away relatively unruffled. The approach up Gardiner Creek, with Mount Clarence King in the background. I arrive at the next pass, King Col, which many people avoid, apparently. It seems fairly standard on the approach. The descent is nasty where there are very few dependable stable rocks. My usual method in these cases is to make to one side and do my best to have a controlled climb down. This one is more difficult than most. 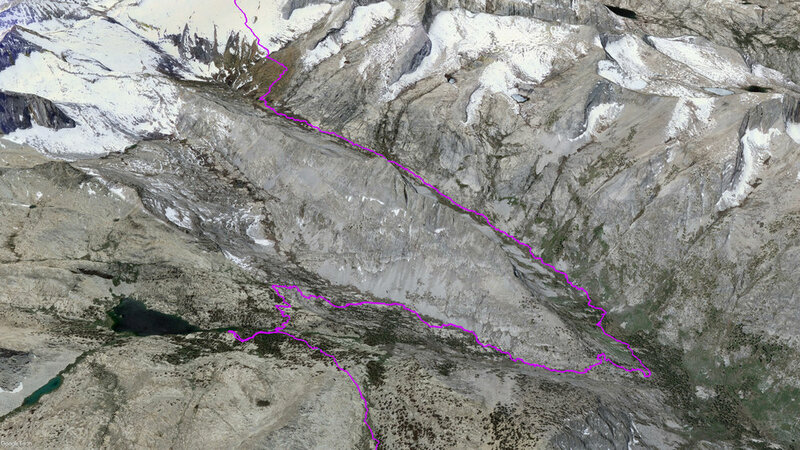 I navigate down a few thousand feet to Wood’s Creek and the JMT. I am on the JMT only a short time before leaving the trail and going north at White Fork. This route is one of three alternatives that Skurka mentions. The approach is a semi-difficult steep loose creek scree and some brush. After awhile the walk is an enjoyable stroll. The creek is colored by some white mineral. Numerous nearby lightning storms pass by quickly, and I take cover a few times from rain, but the bulk of the storm stays distant. This colored rock edifice is very unusual, standing by itself. 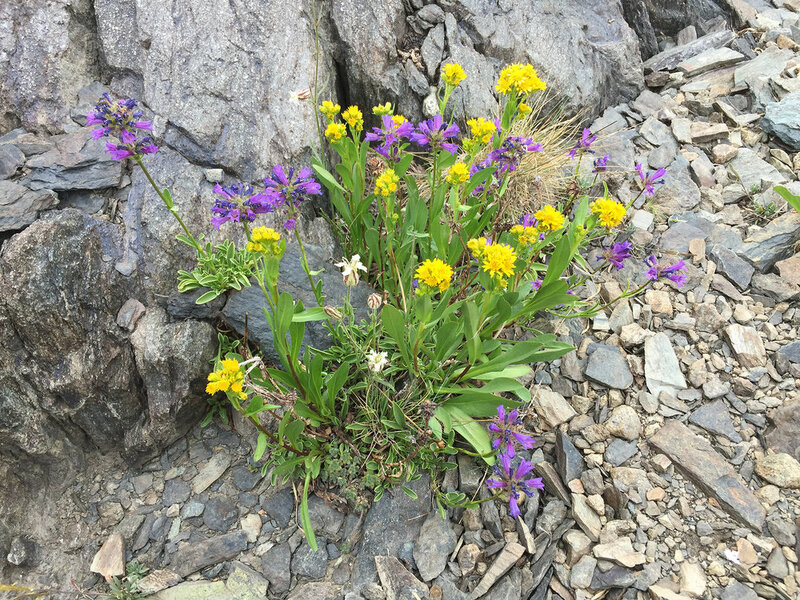 I arrive at Whitefork Pass, and Secor’s description of where to find the pass is not very clear, so I just start climbing and figure it out. The view north from the pass. 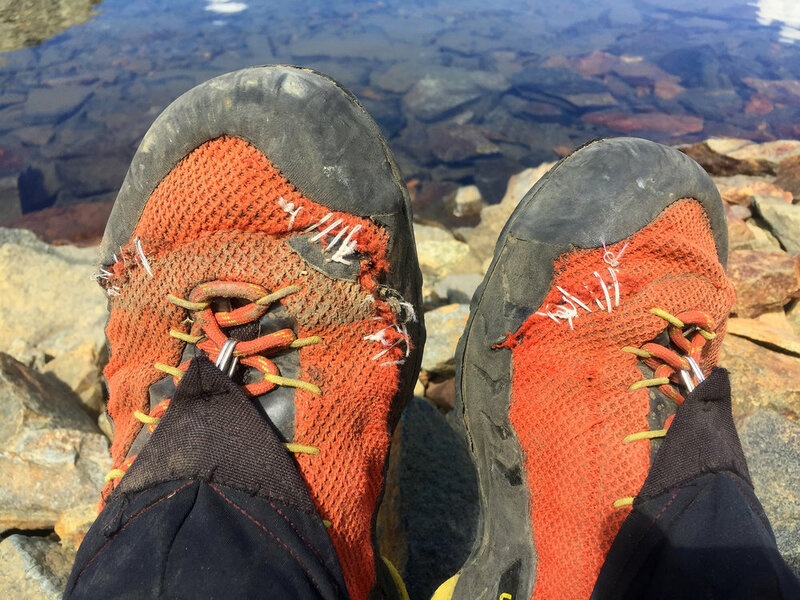 My La Sportiva TX3’s are rapidly disintegrating, and contrary to urban legend, duck tape is not good enough, I need to do some sewing. A deer anticipates my approach up Cartridge Pass; the silhouette of his head and ears can be seen in the bottom of the V.
I drop into the Lake Basin and meet three people. I walked through this same area the year before; it is wonderful mix of rock, water and vegetation. Cataract Creek Pass features another snow cornice. I must decide between dropping all the way down to the lake, or staying high along the ridge above the lake. I choose to drop down and it is probably a mistake; difficult to descend, and difficult to walk along the lake. The view back to Cataract Pass. The descent down Cataract Creek is brushy and steep, with an on-again, off-again use trail. 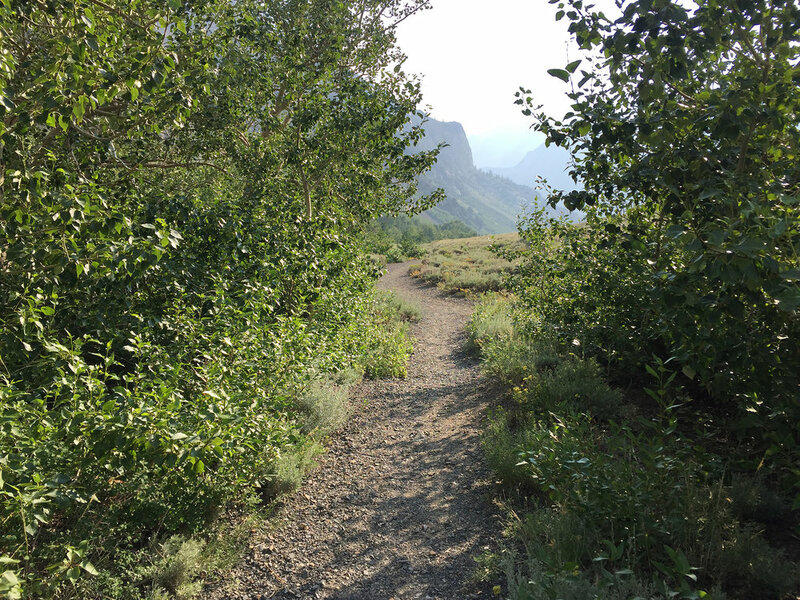 I make it down to Palisade Creek and the JMT. I awake at 4:30 AM and walk 22 miles quickly to South Lake, which I reach by 2 PM. I am clearly in better walking condition than when I began at the beginning of the summer. A pit stop in Lone Pine, 3 more hours of driving, and I am back in Los Angeles. 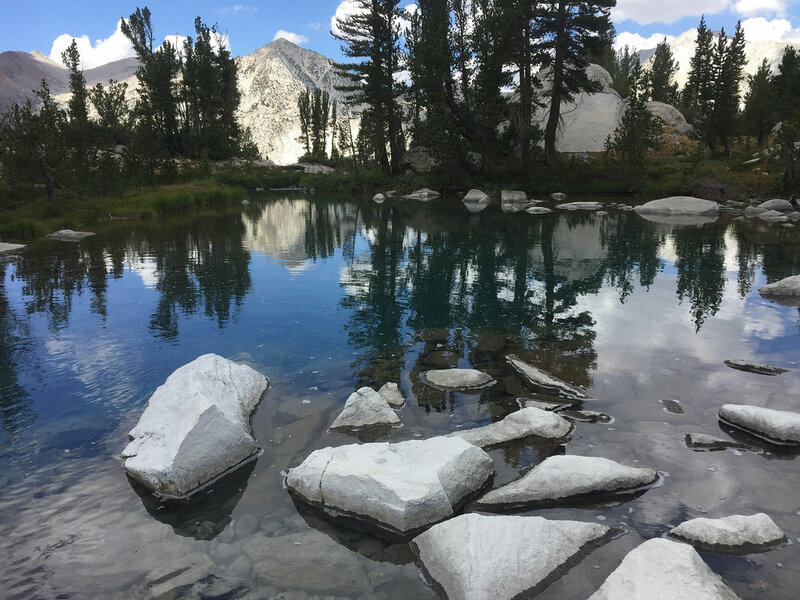 The trip was everything I had hoped for, and I learned more about Kings Canyon. There were a few times where it went from “challenging” to downright “hard”. No doubt, it is a tough route. Next year I might have to pull back just a notch. Still, it made for a memorable summer.